Look at your landscape right now…Could it use a little ground color? A plant with full season color which prefers full day sun, stays low – think 4 inches tall (never higher) and best of all……..has the texture of 100 tiny fern sprays? Did I mention it is evergreen and fully drought tolerant after its first summer of careful watering? It looks great in the dreary spring monsoons with bulbs popping up through the evergreen textural sprays. It is cheery, plucky and graceful all at once. Tips for success: Heathers require good drainage so clay must be well amended. I have two different methods that work well. One is when the entire area has been prepped ala “True Grit” soil prep technique. The other is a “break all the rules” use of bark dust. Neither one can be safely explained in a blog. If you are one of my clients, or client to be, call me and I can walk you through it. It isn’t that hard but it has to be right. Easy care? 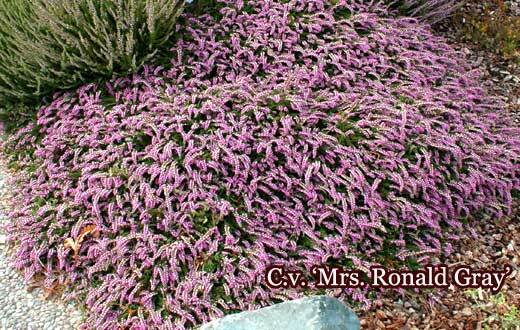 These low creeping mini heathers fit into the true low maintenance landscape because they are the only heather that does not have to be pruned yearly. They also fit into a “passionate, lots of work, hot color, knock your socks off” garden because they can tolerate regular water. These varieties look great with Heuchera (Coral Bell) for instance. Please note they are not for use in rain gardens or at edge of ponds. These plants look great with masses of Hens and Chicks, dwarf conifers, those trendy new Echinacea (Cone Flowers) or with grasses. The heather holds the combination together. These heathers have flowers that stick out at a 90 degree angle which is interesting extra hit of texture. Some of the plants listed have bright foliage in the coldest temps of winter which then holds into mid-spring. A fall planting is the best, you will have fewer plant losses and you can relax a bit which you cannot do with heathers planted in the late spring or in summer. Not relaxing!!!! My mother planted 30 plants in summer and didn’t lose a single one, but I nagged a lot. She was well tired of that by October. I was forgiven because they performed beautifully for many years and my mother does not hold these things against me. Local source is Highland Heather in Canby or mail order is Heaths and Heathers in Shelton, Washington. Highland Heathers sells at the large local plant sales and via quality nurseries. Please like this article on your facebook or forward it your friends.